This was in my driveway yesterday. Apparently, Sasquatch paid us a visit, and he was wearing men's dress shoes. This is undoubtedly the biggest footprint I've ever seen. For comparison, I have placed my non-petite foot next to the mystery print. I wear about a size 8 1/2. If this giant man-beast is going to visit us again, I would suggest more suitable footwear, such as Sorel Boots. 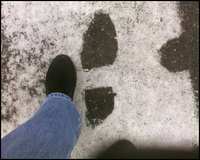 Even fur-covered Sasquatch paw-feet would do better in our frosty, slippery driveway. I wouldn't want Sasquatch to slip and fall and sue us.